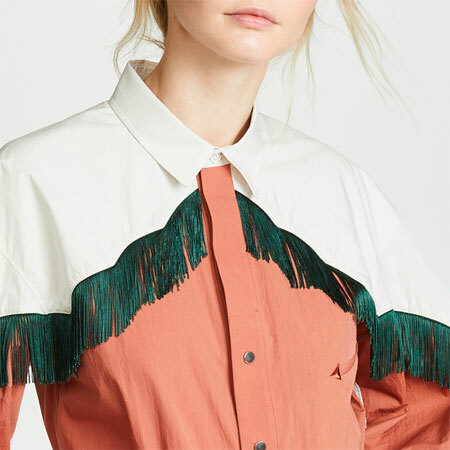 When denim button down shirts started resurfacing in prêt-à-porter collections, I thought, you’ve GOT to be joking. But the penny dropped five minutes later as I saw a whole slew of outfit combinations before me. Now I can’t wait to add the worn looking item back into my wardrobe. Denim shirts have been around for decades and most of us have probably worn them at some point in our lives. Remember the Levi’s version with the press stud buttons that was “it” in the early 90’s? I had one of those and loved wearing it open with black 501’s, a lace camisole and Docs. I don’t want to wear a denim shirt in that way again, but I like the idea of creating a dressier vibe with a similar denim shirt. I love to create contrast in my ensembles. Not only with colour, but also by mixing different levels of dressiness. 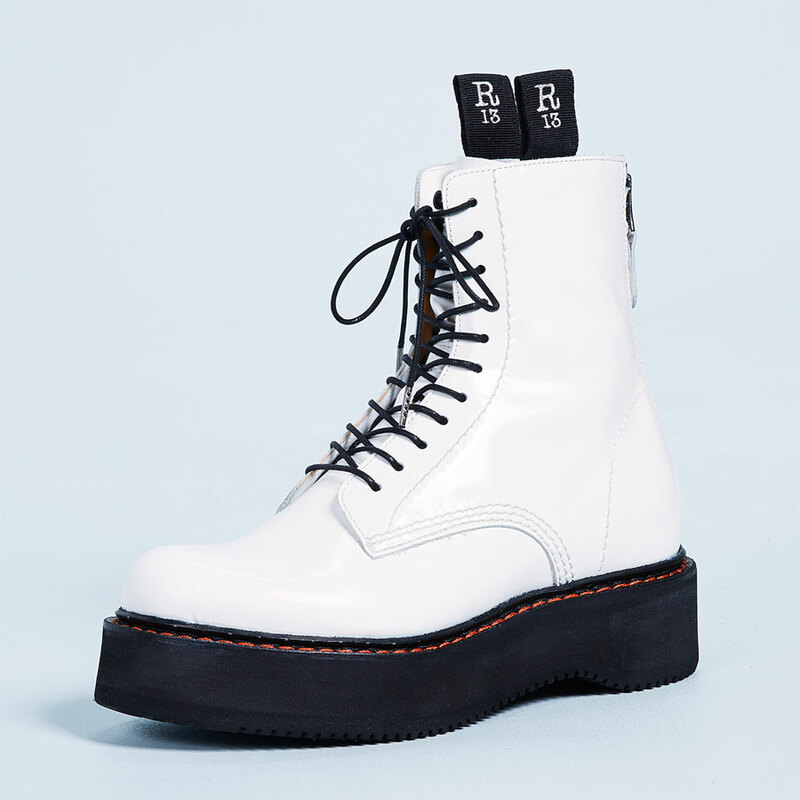 As I write this I’m wearing a dressy, sea green, shantung blouse over a casual pair of denim clamdiggers, matched with a skinny, studded, black double wrap belt. 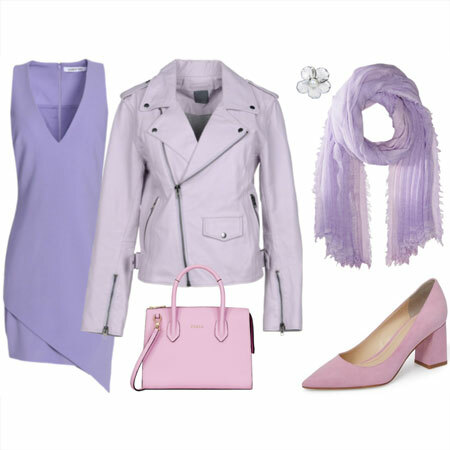 It’s the same idea as pairing a rigid biker jacket with a soft feminine scarf, casual Converse with luxurious white pearls, or a sophisticated black sheath with a worn out webbing belt. As soon as I find a denim shirt that works, I’ll post the looks I have in mind. Better yet, if you have the elements in your wardrobe, post a picture of your remixed denim shirt combinations on our forum as inspiration. So ladies, are you as excited as I am about giving a denim shirt new life? Ignore the prices of these designer examples. I posted them so you can see what’s in the fashion pipeline. You can thrift a suitable denim shirt for $15 and achieve a fabulous remixed look. Hmmm, that’s a negatory, ghost rider. This is a look I didn’t fancy in the 90s and don’t quite fancy now. My husband grew up on a farm and his family are always in denim shirts.. I’m not sure I can wrap my head around that one. I’ll look forward to everyone’s outfits though, I am sure they will be fab! I love love love this idea…and your idea sounds very stylish Angie. I am a thrift store shopper for all my clothes – and am trying not to by anything new, except shoes : ) and intimate apparel. 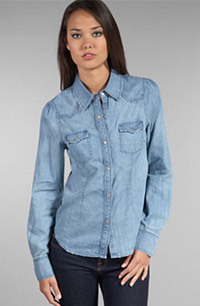 Angie, Is the type of denim shirt you are looking for/referring to a more “fitted” type button down? I am thinking I may not find exactly the right fit – but I can always take it to the tailor! 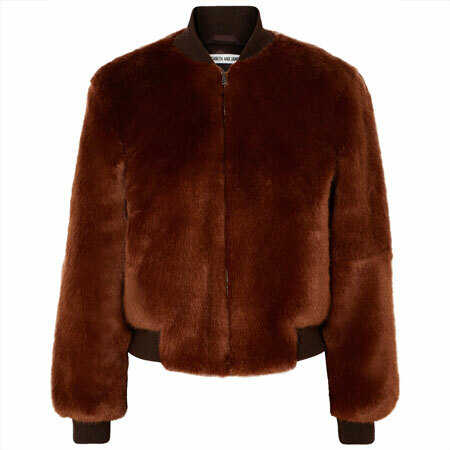 I am excited to incorporate this into my fall/winter wardrobe! Eh, these pictures do nothing for me. They look sloppy, masculine, and uber casual. The chest pockets seem universally unflattering. On one hand, the small of bust will look emptyy and flat. OTOH, a big bust will look evn bigger. The way you have described wearing them sounds intriguing so I shall keep an open mind, but with only these very unappealing pictures as visuals, my gut reaction is pretty cold. If I change my mind, I doubt I would bother since I wear jeans just about every day. On a side note, it looks like the 90s revival is in full swing from here on out. Can’t wait to see what’s next in line. 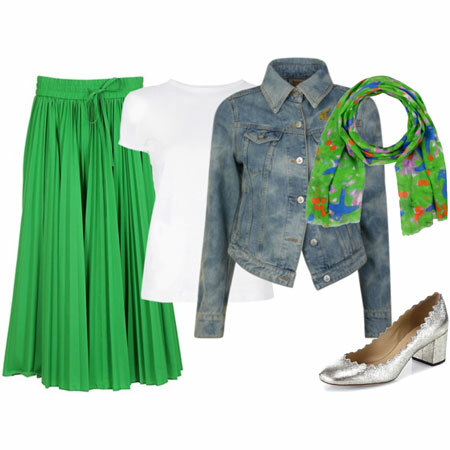 I’m excited with your ideas for this look and will need to check out the thrift stores. I love anything that can make dressier pieces work in a casual way. One of your examples is fitted and one is boxy. Any advice on what fit we should look for? I think I wore jeans shirts back in the 80s, and that was probably enough. I agree with Maya that the models shown don’t do much for me, so I’ll observe on the sideline. With my background of 20 yrs in Carhardts, Levis, work boots, and a hard hat, I don’t wear things this masculine at all. I’m sure it will look good styled as you describe though, just not for me. Everyday when I check the blog, I automatically make a judgement based on the photos before even reading the text. Today, I saw those denim shirts and was not impressed … they make me think of workshirts. Then I read your description of a potential outfit and I can picture it, and even picture it on you! Of course, that changes everything! If I wear one, it would have to be a dark wash, fitted & sleek without chest pockets, and probably paired with colored cords and boots. We’ll see what stores come out with. I wore a denim shirt w/narrow, side zip, black twills EVERY day of getting my BA in Architecture. I loved having a uniform that worked for everything and could be slept in if need be -and yes, it was. I like the idea of a narrower, more body con look for that kind of shirt now. I’d wear it with knits so it was still comfy and there was the contrast in texture and drape. Hmm, may have to thrift this and then do some alterations! I am really excited about this! J. Crew has a couple of these right now, and they are already on my list. :D. Thanks for the great ideas on how to wear this, Angie. I agree with Maya that the chest pockets have to go. I had a really fitted jean shirt that I wore as a jacket over a tee with brown wool herringbone (dressier) slacks and sneakers. Loved it. I’ve been trying to replicate that look for a while but haven’t been able to find a shirt like the one back then. Maybe I’ll find it now that they’re back. I like the cut of the shirt on the left, chest pockets included, but a denim shirt is not something I plan on buying. I loved my denim shirt in the 90s. Like some of the others, I will look for one while thrifting! I know I over-wore my denim shirt in the 90’s- but I would still love to find one to wear now. I think at my age, though, I would stick to a casual look overall. LOVE it!! I have always been a huge fan of denim. I still have the larger oversized one’s that I wore with stirrups in the late ’80’s early ’90’s. However, I think these are a more fitted look. Is that correct Angie? Or, are you envisioning some looser with leggings, etc? Thanks! I think I’ll look for a denim shirt at the local western wear store. That way I can find one that has some nice lines not the old box shaped. I bought a fitted dark blue denim shirt just the other day. I think I will wear it with a fitted grey wool blazer and a gray wool skirt and high heel boots. For other inspirations have a look at the new catalog from Marc O’Polo. I have been on the hunt for one for a couple of weeks! I used to wear super over-sized versions of this for years, but I would love to see what a fitted one looks like. I don’t wear a lot of jeans anyway so I could easily incorporate it into my wardrobe. I was thinking there might even be ways to wear it over certain dresses, with a big belt and ankle boots. I can’t seem to get on board with this, although I’m not sure why. Maybe it’s that the denim used for shirts doesn’t doesn’t strike me as a flattering fabric. 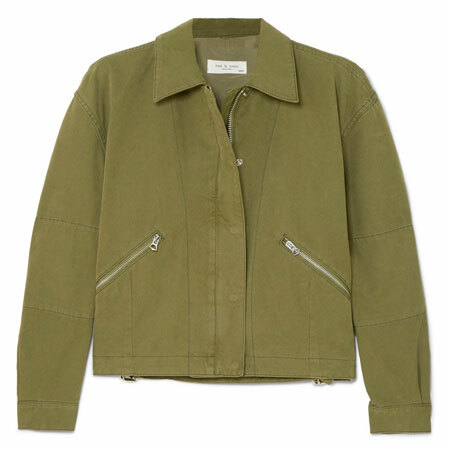 It’s not structured enough to give the clean shape of a denim jacket, but it also doesn’t drape enough to flatter. Am I off base? My eye will have to adjust. Right now I’m not fond of this look. The pictures are very unappealing and boxy. I just can’t see a farm shirt in a sophisticated outfit, but I’m willing to be convinced, even if I don’t adopt the look for myself. WOW, it is not very often at all that I like something and many of the other don’t. Very unsual indeed! 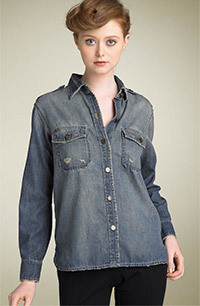 I just googled and found this very cute denim shirt, and it is on sale for 10.95. I may have to break my rule of only buying thrifted clothes. I will create an outfit around it and post photos before I venture outdoors with it on! Honestly, for the look you described to work for me, it’d have to be a really dark and fitted denim shirt that looked like someone didn’t pull it from 1994. I can’t get behind the styles you posted above. Susan D – who would’ve thought Cabela’s would have a nice one??? Cabela’s is my husband’s favorite store and he’s always threatening to buy my Christmas present out of their catalog. I do think that’s a good looking shirt! I’ll have to let this one sink in a while … can’t quite imagine what I’d do with a denim shirt, considering my overall look. But I’m sure I’ll be all over it by November. My mother-in-law wears these and I can’t say I’m fond of the look. I’ve never seen it look anything but unflattering and overly casual in real life. I used to have a fitted denim short sleeved shirt that I wore as kind of a jacket over a white tank and khaki mini in the 1990s. I loved that thing. But I was a lot thinner then! I’m not sure I’ll go back. It seems a bit matronly to me now that I’m actually old enough to be a matron. Nope. Can’t do it again. Makes me cringe. I wore my denim shirt to death in the 90s with black leggings and docs. Hmm they look drab. But I guess a brave fashionable soul will have us seeing the error of our ways soon. Nooooooo. I will never buy a denim shirt. Even on these models they look very boxy and manly as though they’re about to go out and milk the cows or paint the fence. And for most women, we have to buy button-down shirts to fit at the bust, so a denim shirt would REALLY be boxy. Had enough of that look from back in the 90’s when you couldn’t tell the girls from the guys since everyone dressed the same and had the same hair. Ugh, nope. Sorry, Angie. The only thing I’ve liked that even comes close to this look is the chambray shirt that J.Crew has right now. I like how they style it and would MAYBE wear it. The Barefoot Contessa, Ina Garten, on the food channel frequently wears a denim shirt when she’s cooking, in lieu of an apron. That’s a great use for it, and I’m a big fan of hers. While I like the description of the outfit you have in mind Angie, I’m not a big fan of the look in the pictures you posted. I’ll look forward to seeing your outfit and will keep an open mind! I also am not a fan of the pictures posted. I agree with the others that I think I would only wear this on a structured, fitted shirt with no front pockets. I would love to see some pics of others trying this trend on. Maybe one of their looks will inspire me. I’m with Brianna. The J Crew chambray shirt and styling shown in the new catalog really caught my eye. I tried on the pants they showed with it (and wonder how they could flatter anyone) but I still like the shirt and think I could do a lot with it. I wore a denim shirt to death in college, but I’m ready to give it a go all over again — with a modern YLF-inspired twist! Ha! I have a very fitted dark denim shirt from the GAP that I didn’t wear for about 8 years, and I can’t seem to get rid of it. It’s sort of Western wear inspired. I got it back in 1999 or 2000 and wore it as an outer layer. I’m intrigued by your outfit idea, Angie, and may be interested in trying it again, only with more style (hopefully!). Confession! I actually secretly adore the look of the denim tuxedo and have been on the lookout for a good denim shirt ever since I saw Rumi of FashionToast and Cameron Diaz totally rocking them. I found my perfect shirt in a local Goodwill about three days ago–super-fitted and dark blue denim, so that I can wear it for slightly dressier outfits/denim tuxes. Nice to see YLF covering the trend! Other confession: I’m a lurker making her first comment. Love the blog!! I love the idea of wearing a battered denim shirt, belted at the waist over a cream lace sheath and adding cowboy boots. I would wear the shirt as an alternative to a jacket. I will have to see if I can thrift a shirt, I think worn denim will drape better than a stiff new shirt. Thanks for the inspiration Angie. I just thrifted one about a month ago. It is Gap dark denim, western-style with an open collar, nicely fitted. I mean to wear it with a long silk scarf, tweed trousers or skirt, and heeled boots! Kyle – I’ve got the J. Crew shirt & figure I’ll be wearing it forever. I like that theirs doesn’t have the flaps on the pockets & the fit is somewhat shaped & streamlined. I’m wearing it layered over other things, or under a sleeveless plaid dress, or belted. Usually end up rolling up the sleeves & often wearing a girly pin on the collar, a scarf, and/or some bracelets. I agree with everyone that just throwing on one of the boxier styles isn’t stylish, but I’m finding it a nice basic backdrop on a number of days. If you have a boxier one, other than belting it, you can use a nice-sized brooch in the back to nip the waist.